After over a year of rumors and speculation, Rob Gronkowski announce Sunday night that he is officially retiring from the NFL. Gronk rides off into the sunset following the New England Patriots’ victory in Super Bowl LIII, which was the third championship in his nine professional seasons. In today’s world of professional football, the word “generational” gets thrown around far too frequently, but Gronk is a true once-in-a-generation talent who leaves the game as arguably the greatest tight end both in NFL history and in fantasy football history. Over his career, he averaged 4.5 catches, 68.3 yards, and 0.68 touchdowns per game. That’s an almost unfathomable 15.4 PPR points per game. Gronkowski got out of the gate fast, with 10 receiving scores in his rookie season. His initial production looked unsustainable, though, as he managed just 546 yards and 42 catches that season. But Gronk asserted his true dominance in his second season with a massive 1,327 receiving yards and 17 scores on 90 catches – all of which three are career bests – on his way to his first No. 1 fantasy finish among tight ends. 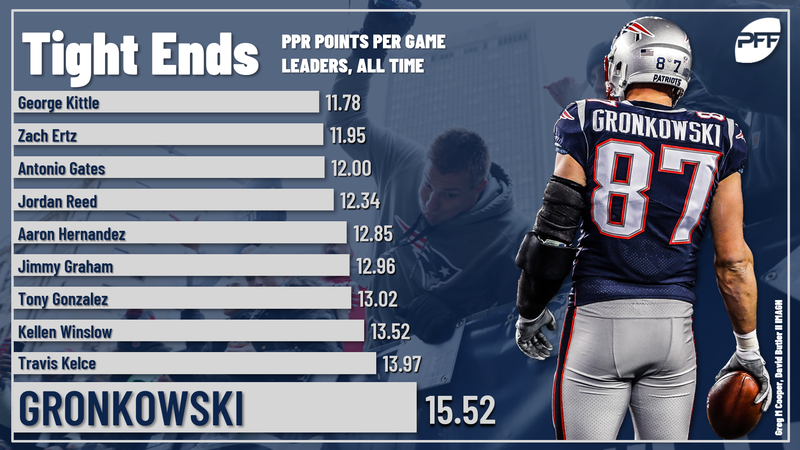 Gronk’s 330.9 PPR points in 2011 is the most ever scored by a tight end. Unfortunately, the string of injuries that have hampered Gronk’s professional career began the next season. The 2011 season was the last time Gronk managed to get through all 16 games. That said, he battled his way to 15 games played in 2014 and 2015, finishing as the top fantasy tight end both years. He also posted a second-place fantasy finish in 2017. Of course, all good things come to an end, and we saw major signs of Gronk’s decline on the field this past season. He again missed time due to injury and finished the season with just three receiving scores in 13 games played. That was a major disappointment to the many fantasy players who drafted him on average in the late second round. While this news doesn’t come as a shocker, Gronk’s retirement marks the end of an era in fantasy football. And there were really two phases in this era. The first was fueled with debates of Gronk or Jimmy Graham and the second with debates of Gronk or Travis Kelce. No matter people fell on those debates, Gronk was always inked in as a top-three fantasy pick. Gronk’s retirement is also pivotal for the New England Patriots, and more specifically, for Tom Brady. The Pats have never really had an elite wide receiver corps in the Gronk era, but they didn’t really need to. Having Gronkowski on the field was essentially like having another wideout. With Gronk out of the mix, the New England depth chart looks extremely bare, with just Matt LaCosse and Jacob Hollister currently in the mix. While the Pats could certainly address the position in the draft, tight ends typically take time before they produce at the pro level. Gronk was an anomaly in that regard. So Brady’s already-declining fantasy stock takes yet another hit. It’s tough to feel comfortable with him as a QB1 option at this point. It’s best to view him as a low-upside front-end QB2. With Gronk out of the mix, time marches on. At tight end, Kelce has emerged as the new torch-bearer at the position. He’s finished No. 1 among tight ends in fantasy scoring in each of the last three years and could end up coming off the board as early as the late first round in 2019 fantasy drafts.